I made a cardboard castle for R to explore some cause and effect relationships. I didn’t get a chance to paint the castle, but lots of fun things were added. I used lots of duct tape and twine to put it all together! 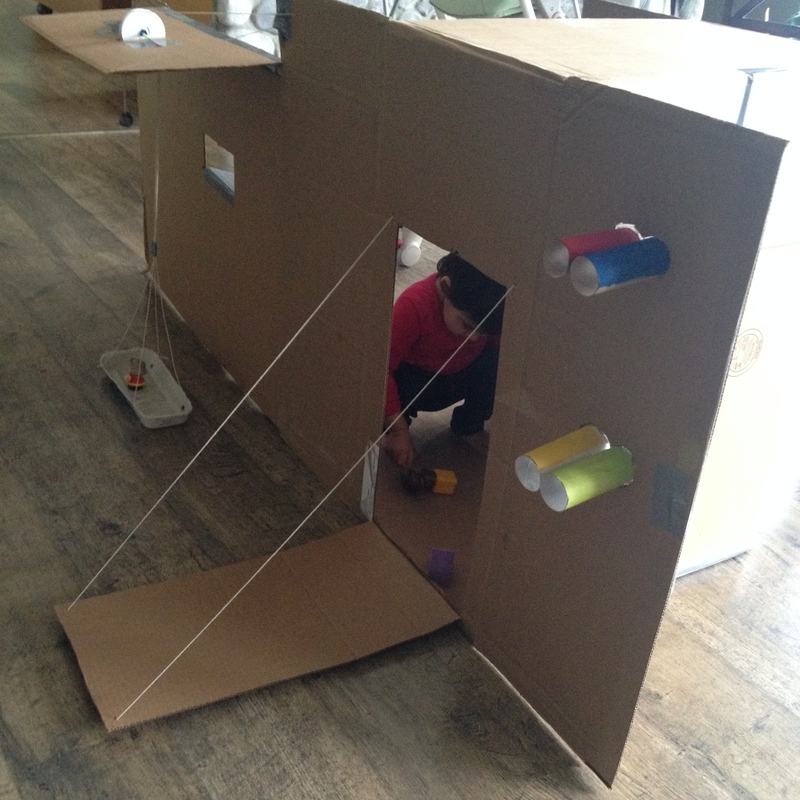 There was a draw bridge, a sliding wall that had spy goggles using cardboard rolls, a room and a pulley mechanism to pull toys up to a window. R played with all the parts of the castle for a long time. I usually tidy up the activities after our activity time, but I left the castle out and she continued to play in there for over an hour and over many days. My favourite part was when she brought in a pillow and laid down inside with her stuffies! Pulley – cut a rectangular hole in a horizontally placed piece of cardboard that is slightly bigger than the size of an empty ribbon roll so that the roll can easily move inside the hole. Attach the empty ribbon roll, vertically, through the hole in the cardboard using a straw. Thread the straw through the centre of the ribbon roll and secure both sides of the straw to the top of the cardboard using duct tape. Make sure the ribbon roll can spin inside the hole in the cardboard. Draw Bridge – Cut three sides of a rectangle out of a vertical piece of cardboard using a box cutter or a knife. Do not the bottom part of the rectangle so that the draw bridge stays attached to the box. Poke two holes at the top of the door part of the draw bridge. Poke two holes in the vertical “wall” of the cardboard castle. Put twine, yarn or other stiff string through the holes of the door. Tie a knot in the twine so that it doesn’t slip through the hole. Leave the twine longer on the inside of the castle and make “handles” by attaching balls of duct tape to the end of the long twine. The child can then use these “handles” to pull on and draw the bridge up and down. Spy Goggles – Paint two cardboard rolls and staple, glue or tape (I stapled) them together once the paint dries. 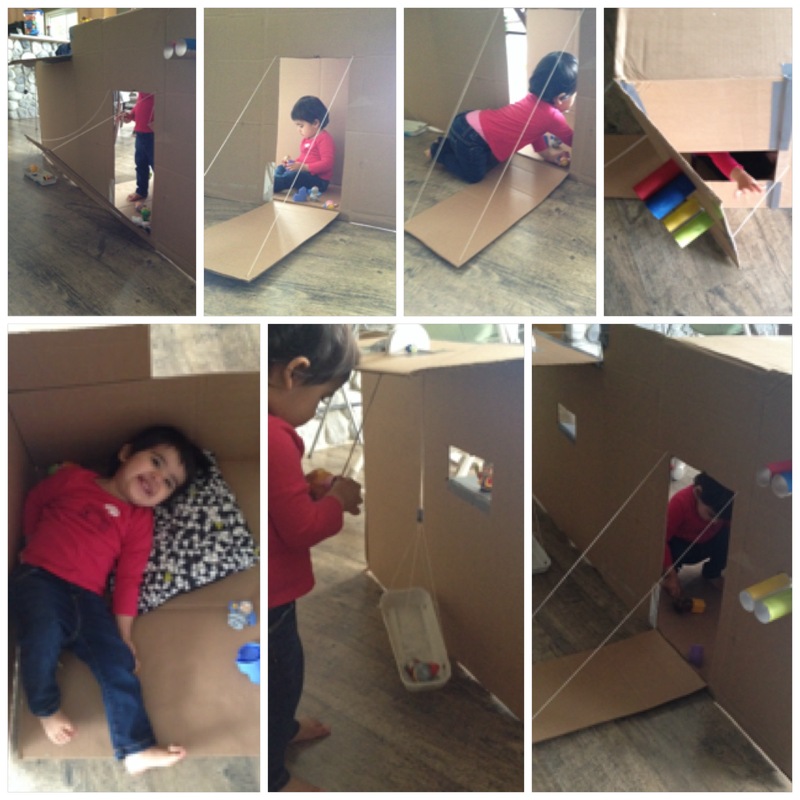 Hold the cardboard rolls against a wall of your cardboard castle at a height that is suitable for your child. Trace around the cardboard rolls using pencil and then cut along the pencil lines. Fit the cardboard rolls inside the hole you just cut out and tape them in place using duct tape. a. 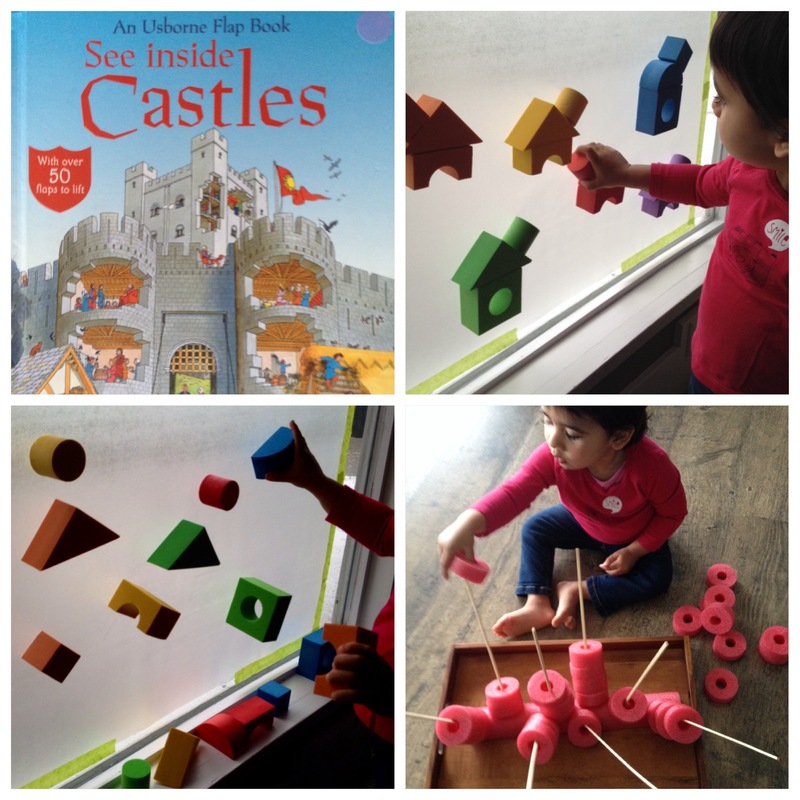 Explore simple machines with the child through books or online and have him/her construct the components of the cause and effect castle on his/her own. Take a look at the PBS Kids page for more simple machine activities here. b. Imaginative Play and Critical Thinking. Ask the child the following open-ended question to encourage imaginative play: What would you need inside your castle so that you could live in there? 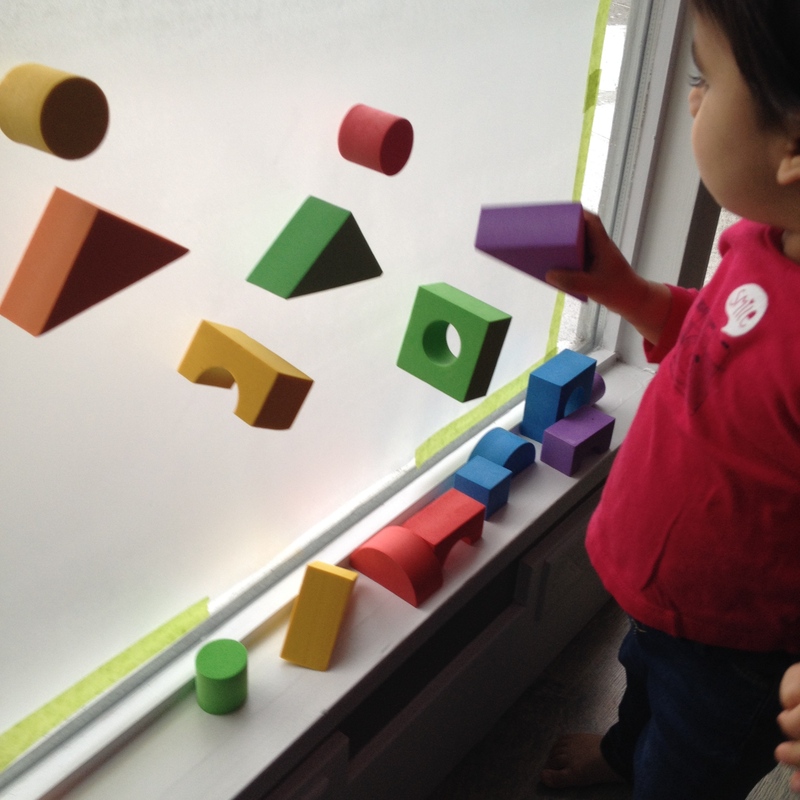 We used soft blocks with contact paper stuck onto a window with the sticky side out for this fun activity. I first put up the blocks to make them look like homes. R took off all the blocks and arranged them in the manager she thought was suitable. Since this activity doesn’t require supervision, I left this out for independent play time throughout the week until R had lost interest in it. I placed the loose pieces of soft blocks on the ledge. When it was time to tidy up, I encouraged R to place the soft blocks back on the ledge to keep this space tidy. a. Encourage beginning writing skills. Provide the child with small pieces of paper and writing tools to label the sticky block structures s/he makes. Stick the label onto the contact paper underneath each structure. b. Work on Observational Drawing Skills. Provide the child with a blank piece of paper and some writing tools. Have the child draw the sticky structure s/he made. Help the child develop his/her observational drawing skills by pointing out key features of the 3D shapes. Younger students can draw 2D versions of their structures. Encourage older children to make their shapes look 3D. I poked BBQ skewers into a pool noodle I cut in half lengthwise (so that it could stand without toppling over). I then gave R cut pieces of pool noodles to thread onto the skewers. She definitely enjoyed this activity, plus it really helped her develop her fine motor skills and hand-eye coordination. 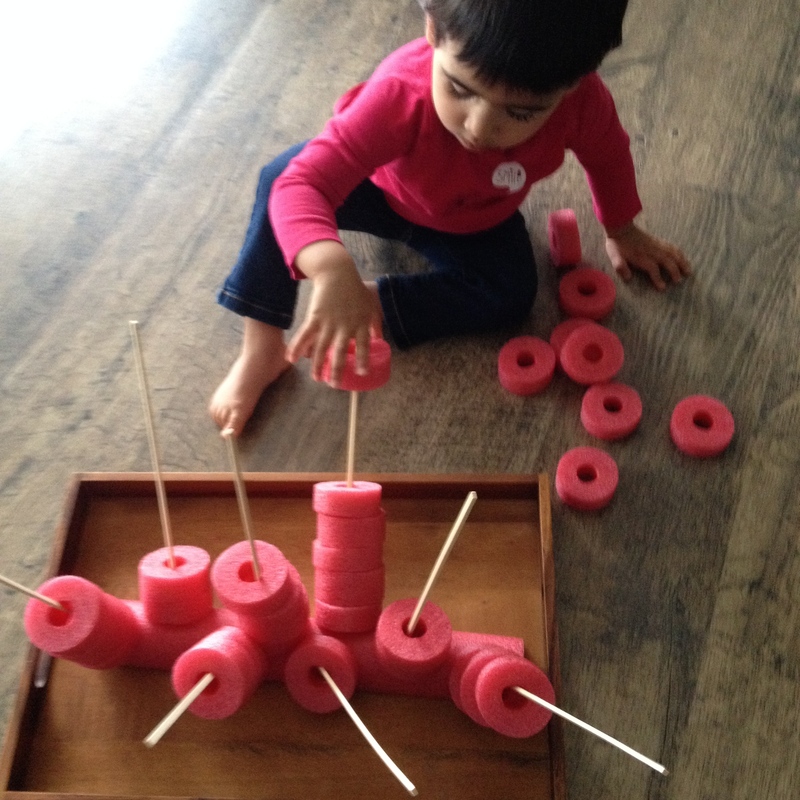 Since the skewer is stiff and the pool noodles have large holes, this activity is perfect for toddlers and older children who need more support with these skills! a. Work on Patterns. Give the child pool noodles of different colours and have him/her make patterns with them. Older children can be encouraged to make more difficult patterns. b. Work on Sorting. In a tub, mix together pool noodle cut outs of different colours and have the child sort the noodles onto the skewers based on colour. Great post! I love Usborne books…such great resources for all ages! Also think the Sticky Block idea sounds like so much fun! thanks, Ritu! I’m totally obsessed with Usborne books! They are really sturdy and have lasted through years of kindergarten and grade 1 students!